Dr. Lawrence Mock received his Doctor of Optometry degree from the University of California Berkeley in 1973. He is a member of the American Optometric Association, the California Optometric Association, and the Alameda Contra Costa Counties Optometric Society. Dr. Lawrence Mock is the founder of Broadway Eyeworks Optometry Group, which was originally located in the Broadway Plaza Shopping Mall. He has been practicing in Walnut Creek since 1983. In his spare time, Dr. Mock enjoys cooking delicious meals for family and friends. Dr. Liane Rumsey received her Bachelor of Science in Nutrition at the University of Californa, Davis. Later, she simultaneously earned a Bachelors degree in Vision Science and her Doctor of Optometry degree from University of California, Berkeley. Dr. Rumsey has been with our practice since 1998. She specializes in high technology multifocal and toric contact lens examinations. Her other areas of interest include pediatrics and pathology. ​Dr. Rumsey is a member of the American Optometric Association, the California Optometric Association, and the Bay Area Optometric Association. Our team of friendly, certified Opticians are always available to assist patients with the important selection of fashion forward eyewear, as well as the latest in digital lens technology. 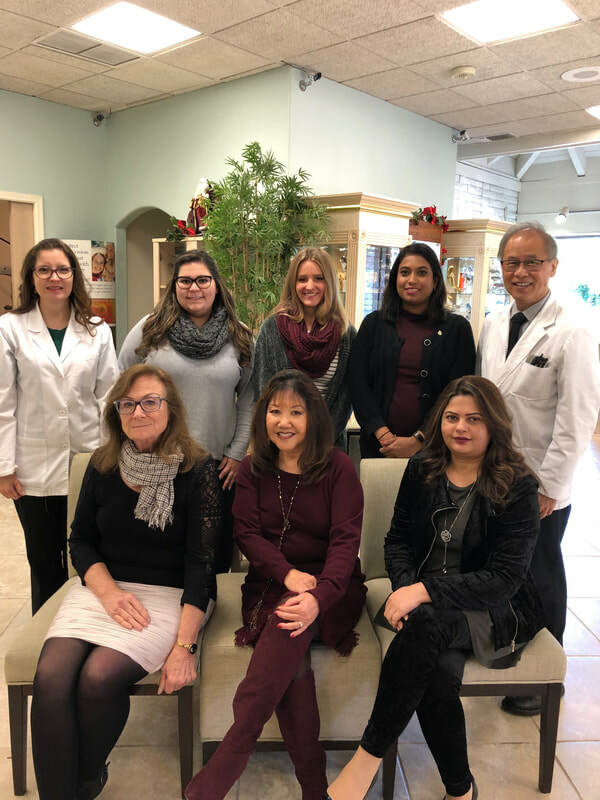 Christine, Suzi, Neelam, Fallyn, Ida and Karen all have extensive experience in explaining your vision plan benefits and helping you select the perfect pair of glasses that suit your prescription and lifestyle. signs of macular degeneration, and diabetic eye disease. We want to thank our loyal patients and everyone in the community for awarding our practice The Best Eyewear in Walnut Creek Magazine. This is truly an honor as we received this award in 2012 and 2014 as well. In 2016, we were voted best of East Bay by Diablo Magazine voters. We want to continue bringing the most popular and fashionable eyewear, along with the best eyecare and latest advances in lens technology.